This little toy will bring a lot of unalloyed joy to any tiny, weentie fellow and it's easy to make, too. Cut out a board for the bottom 3/4 inch thick, 4 1/2 inches wide and 14 inches long; trim down one end of it so that it is 2 inches wide in front as shown at A Fig. 97. Bore a 1/4 inch hole 2 3/4 inches from the front end. Saw off a block of wood 1 inch square and 2Y2 inches long - this is to brace the seat with - and glue this block across the body 6/4 inches from the back as shown by the dotted line in Fig. 97. Make a seat of a board 1/4 inch thick, 1 1/2 inches wide and 3 1/2 inches long and glue or nail it to the block. To make the body or box, cut out two strips of wood 1/4 inch thick and make one 2 inches wide and the other 2 1/2 inches wide and 4 1/2 inches long for the front and back, and two strips of wood 2 inches wide and 6 3/4 inches long for the sides. Nail one of the short strips on the bottom close up to the seat and the blocks of wood it rests on and nail the side strips on the bottom. 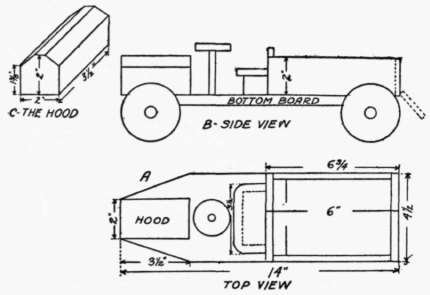 Next round off the lower edge of the short board that is left; set it in between the ends of the sideboards and drive a brad through each of the sideboards and into the tail-board near the bottom; this brings the tail-board so that it can be closed up or let down as the side view at B shows. Saw off two 3/4 inch square blocks and have both of them just a shade over 4 1/2 inches long and these are for the axles. Nail one fast near the rear of the bottom 2 inches from the back end, and nail the other one fast to the front of the bottom 1 inch from the end. Make a hood out of a block of wood 1 3/4 inches wide and long and 2 inches high and bevel off the top as shown at C; nail this to the bottom in front as shown in the top and side views. For the steering wheel saw out a wheel 1/4 inch thick and 1 1/2 inches in diameter. The last thing to do is to saw out four wheels 1/4 inch thick and 2 3/4 inches in diameter; drill a 1/8 inch hole in the exact center of each wheel and screw it on the end of the axle with a 1 inch long, round head, wood screw. Paint the automobile a bright red when it will look like D and run like a fire engine.